Sometimes a picture is worth a thousand words. 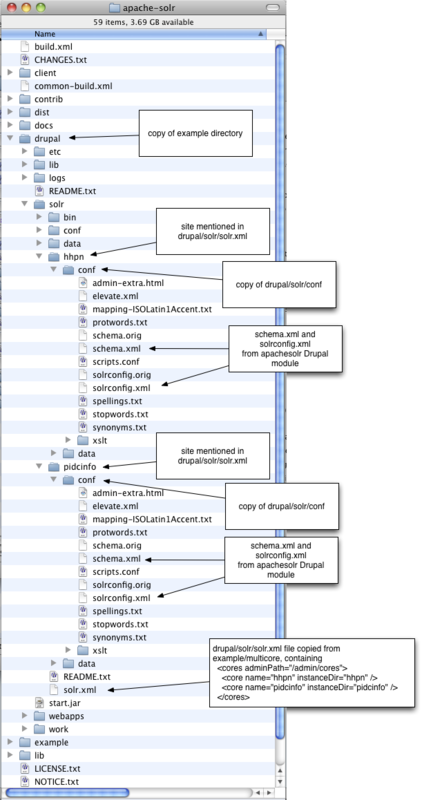 Here's Apache Solr in a multicore setup with two cores, one named hhpn and one named picdinfo. I thought this setup was nice because it allows one site to use the schema from the apachesolr 6.x-1.2 release and one site to use the schema from the 6.x-2.x-dev branch. Permalink Submitted by Steve (not verified) on Wed, 2010-10-13 17:22. This looks a lot like my blog post on this topic. Permalink Submitted by John on Wed, 2010-10-13 21:09. Thanks for the link to an additional resource on this, Steve. I am using Jetty on RHEL5 myself. I mainly just wanted to visualize the instructions for what to copy and where. Permalink Submitted by Steve (not verified) on Thu, 2010-10-14 14:58. Yes, being the visual type, I can appreciate an image like that for helping understand how it's all set up. I probably should have put an image like that in my post. Permalink Submitted by Francewhoa (not verified) on Sun, 2010-10-17 19:17.